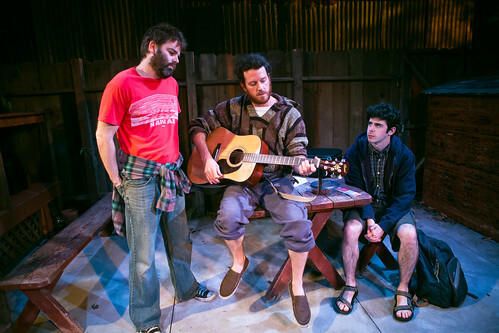 When Annie Baker made her Bay Area debut with Body Awareness at the Aurora Theatre Company, I was impressed by the arrival of an intriguing, intelligent and compassionate new voice on the American theater scene (other folks who had seen Baker’s work were already well aware of this). But it turns out that with Body Awareness Baker was only getting warmed up. Baker’s The Aliens is now running at SF Playhouse, and its brilliance is deceptive. The play seems so very simple. Two 30something slackers have nothing better to do than hang out in the staff break area behind a cafe called the Green Sheep in Baker’s fictional Shirley, Vermont. Their shiftless idyll is interrupted by 17-year-old Evan Shelmerdine, a new busboy at the cafe who insists, in his halting way, that the slackers can’t slack off her. This area is only for staff. Happily, the slackers – KJ the poet and lyricist and Jasper the aspiring novelist – don’t listen to Shelmerdine but instead draw him into their exclusive little club. The Aliens is an absolutely astonishing play. This production, sensitively directed by Lila Neugebauer, reveals all the nuance in the multi-layered play and makes it seem like, on the one hand, not all that much is happening on stage, and on the other, like everything in the world that matters is happening on stage. First we get to know KJ (Haynes Thigpen) and his buddy Jasper (Peter O’Connor). KJ is a little hippie-dippy, good natured and has psychological issues that require medication. Jasper seems more functional in the world, at least he had, until very recently, a girlfriend. Both men are creative. Some time ago they had a band with many names (one of which was The Aliens), and KJ spins out some amazing lyrics. When Jasper reads part of his Great American Novel, it’s actually pretty good and you wouldn’t at all mind hearing some more. When Shelmerdine (Brian Miskell) interrupts their insular little world, what starts out as a threat quickly becomes a reason to celebrate ̶ New blood, a fresh audience, a fellow outcast (Shelmerdine admits he doesn’t have any friends at school). The duo expands into a trio and bonding happens between two 30-year-old dudes and a high school senior. The two-act structure serves the play amazingly well. While we’re at intermission, Evan spends a week at Jewish band camp, and change hits the trio in a big way. The change hits us, too, because we’re deep into the trio as well. This play sneaks up on you, through humor and natural rhythms and simple, exceptionally pointed writing. It’s easy to relate to all three of these men, to feel their slacker joy and fear and anger and affection. The highest praise I can offer Baker is that she seems equal parts Samuel Beckett, Will Eno and Thornton Wilder. But her voice is also wholly original. She’s sharp and harsh and compassionate in equal measure. There’s deep, deep sadness in her play, but there’s also abundant humor, kindness and glimmers of hope. You could argue that her ending is happy (if you’re an optimist) or not so much (if you’re a realist). But within the ambiguity is staggering artistry and the kind of complexity, passion and humanity you crave when you go to the theater. Director Neugebauer elicits wonderful performances from her actors. When we first meet KJ and Jasper, we think we know them. We all know guys like these, but the more time we spend with them, the more Baker reveals and the more Thigpen and O’Connor show us about these unique individuals who have a lot more going on than we might imagine. We come to feel affection for them, but they never lose the tension of their edginess. And Miskell as Shelmerdine is a revelation ̶ so authentically awkward you can’t help but feel protective of him and hope that his growing affection for the slackers doesn’t deter him from the college track. Shelmerdine is responsible for a lot of the evening’s biggest laughs (especially when he comes back from band camp and even his body language is funny), but he’s also got the greatest potential for pain and damage and other brutalities of reality. The Aliens is simply an extraordinary theatrical experience. You fall into a world and come out with your head still partly in that world. It’s almost 24 hours since I saw the play, and I have to say my head has not fully returned from Shirley. 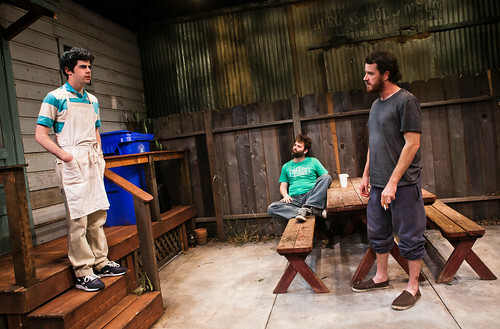 Annie Baker’s The Aliens continues through May 5 at the SF Playhouse, 533 Sutter St., San Francisco. Tickets are $20-$70. Call 415-677-9596 or visit www.sfplayhouse.org.